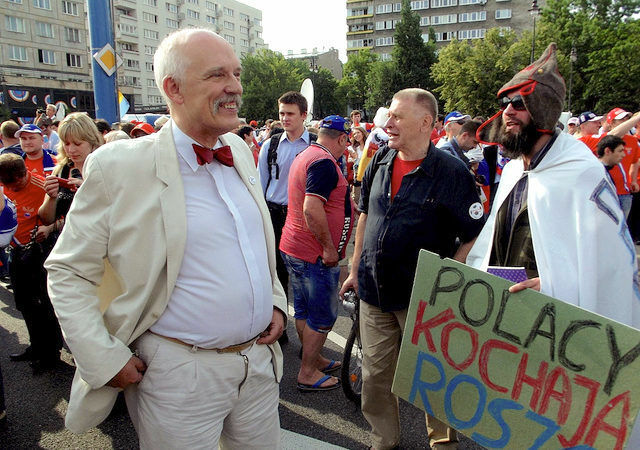 Polish youth favourite: Janusz Korwin-Mikke. Poland’s mainstream parties are increasingly out of tune with voters, according to a new survey. Unsurprisingly, the most popular ones hail from the far right, and, unfortunately, own the youth vote, writes Karolina Zbytniewska. The European Parliament has experienced unprecedented popularity in Poland this year. First, because of the elections for its president, burying the traditional grand coalition. Then, for a vote-stamping CETA with Justin Trudeau’s visit. And now MEP Janusz Korwin-Mikke and his famously sexist parliamentary one-man show where he argued that women must earn less than men. According to the most recent survey, Korwin-Mikke, together with one other anti-establishment politician — ex-rock star Paweł Kukiz — enjoy the strongest support among the Polish youth aged 15-24. Polish youth predominantly support anti-establishment right-wing political parties using radical, mostly negative rhetoric, new research by the Institute of Public Affairs (ISP) and Kantar Public demonstrates. Predominant choices among young Poles are two such parties: Kukiz’15 and Wolność (Freedom). The ruling Law and Justice party (PiS) could count for just around half of their support and the 4th position. When it comes to the negative electorate, as many as 54% of Polish youth declare they definitely wouldn’t vote for the governing party. Generally, all the Polish political parties attract more negative than positive responses, Kukiz’15 and Wolność the least. Still, more young people would definitely not vote for them (23% and 32%) than the other way round. Kukuz’15 was set up by a former rock musician. With a little political experience, Paweł Kukiz entered Polish national politics becoming a dark horse in the 2015 presidential elections. Kukiz achieved a surprisingly high result of 20.80% — and a third place — claiming he would return power to the people. In 2015, based on a predominantly negative agenda, his party entered Poland’s parliament. Today he is the favourite of Polish youth. As many as 15% of young Poles claim they would definitely vote for Kukiz’15, while 12% declared they would probably vote for it. Their second choice is Wolność — the party of Janusz Korwin-Mikke, an infamous Polish politician and MEP (independent) — following a conservative and anti-EU agenda. Last week, its leader managed to steal the EU show from Juncker’s 5 scenarios and Tusk’s succession dispute for one disgraceful moment. “Of course women must earn less than men because they are weaker, the are smaller, they are less intelligent,” he said with a roughish smile during the European Parliament’s plenary gender pay gap discussion shocking the few fellow MEPs present (VIDEO). For the Polish audience, his provocative views come as no surprise – Korwin-Mikke never misses an opportunity to insult women, the handicapped, refugees, the pope, whomever. There is no reason for young Poles to turn away from him. His party enjoys the second biggest number of supporters amongst Polish youth. 11% claim they would definitely vote for it, 8% probably. As the survey also proves, young women offer less support to radical parties and have less radical and more centrist views than men. Still, both Kukiz and Korwin-Mikke win among them anyway. 35% of young men would choose Kukiz, and 20% women. Much less, but still the most. More shocking is that despite the above mentioned sexist views declared by Korwin-Mikke, 14% of young women (as opposed to 25% young men) would give him their vote. The survey shows one more interesting result: the negative electorate significantly outnumbers the positive one for all parties. The ruling PiS, who won the 2015 presidential and parliamentary elections running on predominantly anti-establishment rhetoric, evidently disappointed the youth, losing a huge part of its support. In the 2015 parliamentary elections, the PiS won among all age groups, reaching as much as 25.80% from the young voters (aged 18-29). But, today, to repeat, only 7% would definitely vote for them, while 6% would likely do it. Today they lead the negative electorate ranking. As many as 54% young voters say they wouldn’t choose them. In the 2015 elections, Kukiz’15 and Wolność attracted a significant share of the voting cake. Kukiz attracted 19.90% and Korwin 16.80% of the young voters. It was especially striking with Korwin, who didn’t manage to reach the parliamentary 5% threshold, which means its radical language does not find an audience except among the youngest of voters. One conclusion is evident: young people are attracted by straightforward radical language. It was evident in the 2015 elections in Poland and it is visible today in the ISP’s and Kantar’s research. And it does not matter that strong language isn’t usually backed by any positive political agenda whatsoever — quite the opposite. It is usually empty talk, rudely opposing the status quo, not offering anything in exchange. Disclaimer: Mentioning Janusz Korwin-Mikke is questionable from the point of journalistic responsibility. Why? Because it provides sexist, populist, and generally low discourse unwarranted visibility. Still, we find that ISP and Kantar Public’s research important as it sheds some light on what is going on in the EU now. And it is tough to find solutions when you lack a proper diagnosis. Now you’ve gotta be joking!! Kukiz a Nazi – ha ha ha ha ha ha!!! Sorry … must go to the toilet …! Drinking coffee right in your home while you’re making money through trading has never been this good. Want to know about it? Google Superior Trading System. Any tangible example of this? Simply presenting an opinion the writer finds objectionable is not an insult. It is not shocking that young women have no problem voting for him. The gist of his argument, as unrefined and course as it was, is simply that the market values women differently than it does men, and that this is a result of innate biological differences between the sexes. Does the writer Zbytniewska contend that Korwin-Mikke was deliberately lying and a female actually placed higher than 800th in the Polish theoretical physics Olympiad or that there are female Chess players in the top hundred? If so, she should straight out say it. It would be helpful for the reader what exactly Zbytniewska’s problem with Korwin-Mikke’s speech was. Did it insult her feelings? Because Korwin-Mikke’s right to express his opinion doesn’t end where Zbytniewska’s feelings begin. IE young people are dumb, is what the writer implies, or perhaps her cognitive capacity is too limited to offer any other sensible explanation. This is a fundamentally evil moral position for a journalist to take. It is not up to the journalist to silence public dissent, to determine who or what gets visibility, and most importantly it absolutely goes against journalistic integrity for the journalist to take it upon herself to influence and manipulate voting behaviour. You exist to serve the public, not to sermonize them and silence political candidates. You are not my priestess, Karolina Zbytniewska, and I do not answer to your moral judgment. PS: I understand more and more why PiS felt the need to “clean house”!